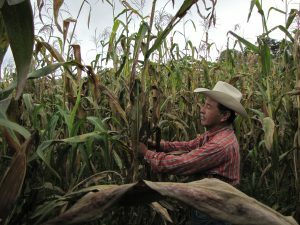 Felix Corzo Jimenez , a farmer in Chiapas, Mexico, examines one of his maize plants infected with tar spot complex. Rural women play a critical role in enhancing agricultural and rural development, improving food security and eradicating rural poverty. 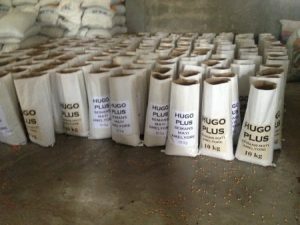 They provide innumerable benefits to agricultural systems around the world at all levels of the value chain, but their contributions often go unrecognized. 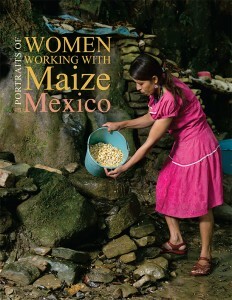 This year, for the U.N. International Day of Rural Women (IDRW) on October 15, the CGIAR Research Program on Maize (MAIZE) would like to honor the significant contributions that women make to agriculture around the world by sharing photos and stories via our social media channels from our new book, “Portraits of Women Working with Maize in Mexico.” This nationwide documentary initiative seeks to shine light on the often unseen contributions that rural women make to their families, communities, countries and the world through agriculture. The CIMMYT Global Maize program, with funding from the MAIZE CRP, recently produced a series of videos on nixtamalization, the process of cooking and steeping dried maize grain with water and lime (calcium hydroxide) in order to unlock important nutritional benefits. The video is meant to serve as an instructional tool to inform the public about the positive nutritional and physical characteristics the nixtamalization process can bring to maize. Nixtamalization is a traditional maize preparation method that has been practiced in Central America for centuries. The process induces changes in the kernel’s structure, chemical composition, physical properties and nutritional value; increasing the calcium content as well as the bioavailability of protein and niacin. This helps to prevent malnutrition and related diseases such as pellagra and kwashiorkor in populations that consume a maize-based diet, as maize, while very nutritious, is deficient in certain important amino acids in its raw form. The nixtamalization process also allows for the creation of masa, or maize dough, which can be formed into many traditional food items that form the basis of Central American diets, such as tortillas. The videos explain both the traditional domestic and modern industrial process of nixtamalization, and include interviews with local “nixtamalization experts,” millers and tortilla makers who have been practicing the art of nixtamalization for decades. To view the video on the nixtamalization process, please click here. To view the “nixtamalization expert” video, please click here.